Our sales team is headed up by Steve Linder. Steve is VP of sales and he leads the firm's sales initiative. He provides sales materials, DVD's and other promotional ideas to sales reps and alliance partners. Steve is the guy you will likely meet at shows, doing presentations, as keynote speaker or leading a seminar or workshop. Kristina Welburn is the star of the company. Kristina develops the company newsletter, The Paradise Post, as well as most marketing materials. She also leads sales and marketing initiatives on the world wide web. Kristina serves on a number of non profits, as board member, contract employee or grant writer. She's got one of the biggest hearts in the world and donates much of her time to non profits and other philanthropic endeavors. 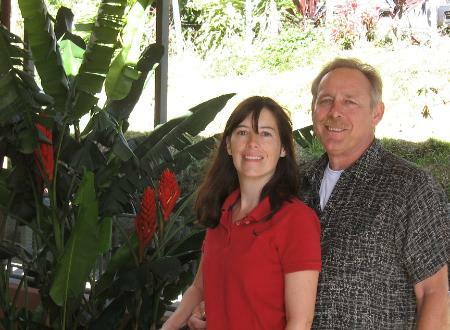 Steve and Kristina became involved with the Ventana del Pacifico project in Costa Rica initially as clients. They formed the company, Pacific Lots of Costa Rica, to build a sales presence for the company in the US, Canada and Europe. We sell through our team of sales reps, customer referrals, a busy show schedule and a sizable number of realtors and alliance partners. We also work with both AARP and International Living. We work with a some of the larger realty firms in the US as well as a number of investment groups and affiliate organizations. Pacific Lots leads tours of Costa Rica as well as our development. We bring guests to a variety of destinations within Costa Rica to give a better overview of the country. We encourage anyone who is interested in discovering Costa Rica to contact us about a visit to the guest house, where you can experience the quality of life we enjoy every day. You will quickly see why so many people who have visited our properties become owners. We offer a variety of tour dates, 4 day Discovery tours per month. We can fit a tour around your schedule or you can work with our schedule and travel with a small group. If you end up purchasing a home site in our development, the cost of the tour and travel is generally paid for by us through a $1000 travel credit discounted off the price of the lot. It's our buy and fly free program.